The following excerpts are from a monograph published on the occasion of the first retrospective exhibition of sculpture by Isamu Noguchi held at the Whitney Museum of American Art in 1968. The text is by John Gordon. He was sensitive to his surroundings: his recollections of Japan are mostly of natural things--the sea near his house, potato fields, the pines of Hiroshige, the wood used in construction of his house, a stone for his garden, sunsets. As a boy he learned the use of carpenters' tools, to make carvings in cherry, and had his own garden before he was eleven. 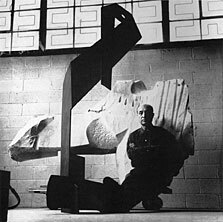 Though he received almost universal acclaim from critics, Noguchi, like most artists of his generation had little financial success. in the 1940's he was forced to be inventive and economical. At this time he was intrigued by the fact that flat marble slabs, which were readily available in New York, were comparatively reasonable in price compared to the cost of large blocks. The remarkably successful Gunas and similar works ... were the result. 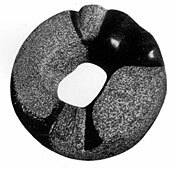 Skeletal in form, ambiguous in meaning, occasionally with sexual overtones, they are somewhat surrealist in nature.... All are of fine, highly polished stones. With rare perception Thomas B. Hess wrote: "In America today where sculpture is the most unpopular, misunderstood and least practiced of arts, where the great majority of sculptors rely upon eccentricity or compromise, Noguchi has built an experimental art on the traditions of the past which is relevant to both present and future." ... Incorporating found objects in his work has not been a major interest, but bones and driftwood have been used. Sometimes the shape and surfaces of found stones have been improved. In his own words: "Sculpture may be made of anything and will be valued for its intrinsic sculptural qualities. However, it seems to me that the natural mediums of wood and stone, alive before man was, have the greater capacity to comfort us with the reality of our being. They are as familiar as the earth, a matter of sensibility. In our times we think to control nature, only to find that in the end it escapes us. I for one return recurrently to the earth in my search for the meaning of sculpture--to escape fragmentation with a new synthesis, within the sculpture and related to spaces. I believe in the activity of stone, actual or illusory, and in gravity as a vital element. Sculpture is the definition of form in space, visible to the mobile spectator as participant. Sculptures move because we move."